James Kenneth "Jim" Lefebvre (born January 7, 1942) is a former second baseman, third baseman, manager and coach in Major League Baseball, and television actor. Lefebvre, the 1965 National League Rookie of the Year, was signed by the Los Angeles Dodgers as an amateur free agent in 1962. In 1965, his rookie year, he hit .250 with 12 home runs and 69 RBI. Lefebvre was named to the All-Star Game in 1966. He also played four seasons in Japan, from 1973 until 1976, for the Lotte Orions. He was a big league manager from 1989–1993, and then again in 1999. Lefebvre was formerly the hitting coach for the Cincinnati Reds. He became the first player to have won a World Series (1965 Dodgers) and a Japan Series (1974 Lotte Orions). In 1965, he was part of an infield for the Dodgers that consisted of four players who were switch hitters. The others were Jim Gilliam, Wes Parker, and Maury Wills. In addition to managing, Lefebvre has spent time coaching in the Dodgers, Milwaukee Brewers, San Francisco Giants, Cincinnati Reds, and San Diego Padres organizations. 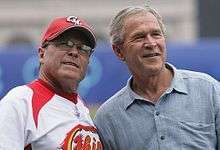 He also coached the China National Baseball Team (Olympics) in 2005, the 2006 World Baseball Classic, and 2008 Olympics. He is also a spokesman for Vemma vitamin supplements. His son is current Kansas City Royals television announcer Ryan Lefebvre. Lefebvre had roles on several television shows including Gilligan's Island and Batman. His role in Batman was of a henchman for the Riddler. Lefebvre has a daughter, Brittany Lefebvre, who is currently working in Christian motion pictures. His son, Ryan, is currently a broadcaster for Fox Sports Kansas City. 1 2 Krasovic, Tom (2009-02-28). "'Put the ball in play' : New hitting coach Jim Lefebvre has some ideas to make the Padres more productive at the plate". The San Diego Union-Tribune. Retrieved 2009-03-01.